Igadevil hook us up with Kamen Rider DiEnd's theme, Treasure Sniper, sung by Daiki Kaitou's actor, Tatani Kimito. This is the second ending theme (or a battle theme) for the toku, Kamen Rider Decade. Plus, another BONUS! 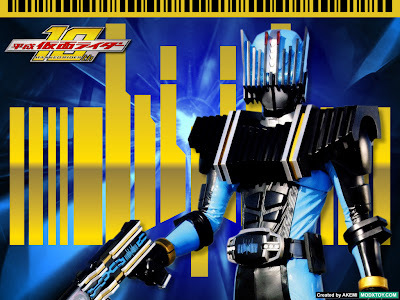 He also included Final Attack Ride Hibiki. It was used in the final battle on Hibiki's world (Episode 19) wherein all of them teamed up to beat the giant Makamou.